Mrs Marilyn Monroe sang this song in the hit movie “Gentlemen prefer Blondes”. It might be only a sentence, but most women in the World agree with her. Maybe because Diamonds are forever so it is seen as a concrete symbol for a good marriage. The beautiful Marilyn during her short life got married three time, in 1942, in 1954 and 1956, but only once she receive a fantastic diamond ring. It wasn’t an engagement ring but a fantastic wedding ring. 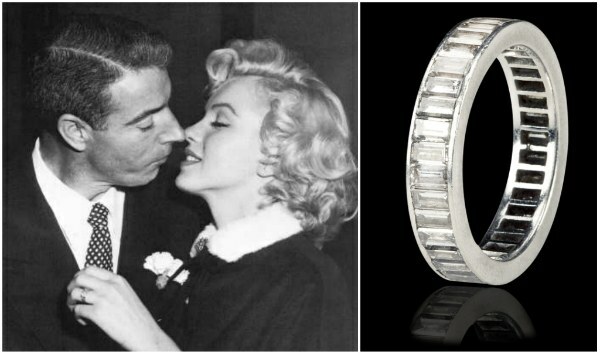 Joe Di Maggio slipped on Marilyn Monroe’s finger this amazing platinum eternity band set with 35 baguette-cut diamonds, on January 14, 1954 when he married his Marilyn in a judge’s chambers at San Francisco’s City Hall. This very unique ring signified the hope of a harmonious future that would never happen. A lasting union between Marilyn Monroe and Joe Di Maggio clearly was not meant to be. Just eight months after their wedding ceremony, the couple separated amid a storm of jealous rows. Two months later, the marriage was no more, and the diamond eternity wedding band was seen no more. Marilyn and Joe’s wedding wrecked and they took different paths, but deep in their hearts the love that bounds them, remained. Mainly was Joe to preserve his unconditional love for Marilyn and he proved when she died 53 years ago; he organized her funeral and for the next 20 years, he sent a dozen roses on her grave. In my opinion, this kind of love crosses the eternity and Joe was the living prof. This entry was posted in General and tagged #buccellati, #cartier, #cartierring, #diamonds, #tiffany&co, #weddingring, #weddingrings.